, any one of a class of simple organic compounds containing carbon, hydrogen, oxygen, nitrogen, and in certain cases sulfur. These compounds are the building blocks of proteins. 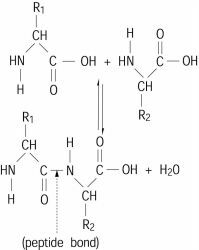 organic compound composed of amino acids linked together chemically by peptide bonds. The peptide bond always involves a single covalent link between the α-carboxyl (oxygen-bearing carbon) of one amino acid and the amino nitrogen of a second amino acid. ..... Click the link for more information. bonds. The amino acids, linked together, form linear unbranched polymeric structures called polypeptide chains; such chains may contain hundreds of amino-acid residues; these are arranged in specific order for a given species of protein. , organic compound composed of both a protein and a carbohydrate joined together in covalent chemical linkage. These structures occur in many life forms; they are prevalent and important in mammalian tissues. , any organic compound that is composed of both protein and the various fatty substances classed as lipids, including fatty acids and steroids such as cholesterol. , any one of a class of fibrous protein molecules that serve as structural units for various living tissues. The keratins are the major protein components of hair, wool, nails, horn, hoofs, and the quills of feathers. , any of a group of proteins found in skin, ligaments, tendons, bone and cartilage, and other connective tissue. Cells called fibroblasts form the various fibers in connective tissue in the body. protein produced by the immune system (see immunity) in response to the presence in the body of antigens: foreign proteins or polysaccharides such as bacteria, bacterial toxins, viruses, or other cells or proteins. secretory substance carried from one gland or organ of the body via the bloodstream to more or less specific tissues, where it exerts some influence upon the metabolism of the target tissue. a protein abundantly present in many cells, especially muscle cells, that significantly contributes to the cell's structure and motility. Actin can very quickly assemble into long polymer rods called microfilaments. , one of the two major protein constituents responsible for contraction of muscle. In muscle cells myosin is arranged in long filaments called thick filaments that lie parallel to the microfilaments of actin. ..... Click the link for more information. , the contractile muscle proteins. Every protein molecule has a characteristic three-dimensional shape, or conformation. Fibrous proteins, such as collagen and keratin, consist of polypeptide chains arranged in roughly parallel fashion along a single linear axis, thus forming tough, usually water-insoluble, fibers or sheets. Globular proteins, e.g., many of the known enzymes, show a tightly folded structural geometry approximating the shape of an ellipsoid or sphere. Because the physiological activity of most proteins is closely linked to their three-dimensional architecture, specific terms are used to refer to different aspects of protein structure. The term primary structure denotes the precise linear sequence of amino acids that constitutes the polypeptide chain of the protein molecule. Automated techniques for amino-acid sequencing have made possible the determination of the primary structure of hundreds of proteins. The physical interaction of sequential amino-acid subunits results in a so-called secondary structure, which often can either be a twisting of the polypeptide chain approximating a linear helix (α-configuration), or a zigzag pattern (β-configuration). Most globular proteins also undergo extensive folding of the chain into a complex three-dimensional geometry designated as tertiary structure. Many globular protein molecules are easily crystallized and have been examined by X-ray diffraction, a technique that allows the visualization of the precise three-dimensional positioning of atoms in relation to each other in a crystal. The tertiary structure of several protein molecules has been determined from X-ray diffraction analysis. Two or more polypeptide chains that behave in many ways as a single structural and functional entity are said to exhibit quaternary structure. The separate chains are not linked through covalent chemical bonds but by weak forces of association. The precise three-dimensional structure of a protein molecule is referred to as its native state and appears, in almost all cases, to be required for proper biological function (especially for the enzymes). If the tertiary or quaternary structure of a protein is altered, e.g., by such physical factors as extremes of temperature, changes in pH, or variations in salt concentration, the protein is said to be denatured; it usually exhibits reduction or loss of biological activity. study of the materials that nourish an organism and of the manner in which the separate components are used for maintenance, repair, growth, and reproduction. Nutrition is achieved in various ways by different forms of life. , antibiotic produced by soil bacteria of the genus Streptomyces and active against both gram-positive and gram-negative bacteria (see Gram's stain), including species resistant to other antibiotics, e.g. , antibiotic effective against a wide range of gram-negative and gram-positive bacteria (see Gram's stain). It was originally isolated from a species of Streptomyces bacteria. , any of a group of antibiotics produced by bacteria of the genus Streptomyces. Effective against a wide range of Gram positive and Gram negative bacteria, tetracycline interferes with protein synthesis in these microorganisms (see Gram's stain). ..... Click the link for more information. , can be understood in terms of their ability to interfere with some stage of protein synthesis in bacteria. The linear arrangement of the amino acid residues in a protein is termed its sequence (primary structure). The sequence in which the different amino acids are linked in any given protein is highly specific and characteristic for that particular protein. Proteins are not stretched polymers; rather, the polypeptide backbone of the molecule can fold in several ways by means of hydrogen bonds between the carbonyl oxygen and the amide nitrogen. The folding of each protein is determined by its particular sequence of amino acids. The long polypeptide chains of proteins, particularly those of the fibrous proteins, are held together in a rather well-defined configuration. The backbone is coiled in a regular fashion, forming an extended helix. As a result of this coiling, peptide bonds separated from one another by several amino acid residues are brought into close spatial approximation. The stability of the helical configuration can be attributed to hydrogen bonds between these peptide bonds. In addition to hydrogen bonds, there are electrostatic interactions, such as those between COO- and NH3+ groups of the side chains, and van der Waals forces, that is, hydrophobic interactions, which help to determine the configuration of the polypeptide chain. The term secondary structure is used to refer to all those structural features of the polypeptide chain determined by noncovalent bonding interactions. In addition to the α-helical sections of proteins, there are segments that contain β-structures in which there are hydrogen bonds between two polypeptide chains that run in parallel or antiparallel fashion. The tertiary structure (third level of folding) of a protein comes about through various interactions between different parts of the molecule. Disulfide bridges formed between cysteine residues at different locations in the molecule can stabilize parts of a three-dimensional structure by introducing a primary valence bond as a cross-link. Hydrogen bonds between different segments of the protein, hydrophobic bonds between nonpolar side chains of amino acids such a phenylalanine and leucine, and salt bridges such as those between positively charged lysyl side chains and negatively charged aspartyl side chains all contribute to the individual tertiary structure of a protein. Finally, for those proteins that contain more than one polypeptide chain per molecule, there is usually a high degree of interaction between each subunit, for example, between the α- and β-polypeptide chains of hemoglobin. This feature of the protein structure is termed its quarternary structure. The properties of proteins are determined in part by their amino acid composition. As macromolecules that contain many side chains that can be protonated and unprotonated depending upon the pH of the medium, proteins are excellent buffers. The fact that the pH of blood varies only very slightly in spite of the numerous metabolic processes in which it participates is due to the very large buffering capacity of the blood proteins. Distinct proteolytic mechanisms serve different physiological requirements. Proteins can be divided into extracellular and intracellular, and the two groups are degraded by two distinct mechanisms. Extracellular proteins such as the plasma immunoglobulins and albumin are degraded in a process known as receptor-mediated endocytosis. Ubiquitin-mediated proteolysis of a variety of cellular proteins plays an important role in many basic cellular processes such as the regulation of cell cycle and division, differentiation, and development; DNA repair; regulation of the immune and inflammatory responses; and biogenesis of organelles. Molecular chaperones are specialized cellular proteins that bind nonnative forms of other proteins and assist them to reach a functional conformation. The role of chaperone proteins under conditions of stress, such as heat shock, is to protect proteins by binding to misfolded conformations when they are just starting to form, preventing aggregation; then, following return of normal conditions, they allow refolding to occur. Chaperones also play essential roles in folding under normal conditions, providing kinetic assistance to the folding process, and thus improving the overall rate and extent of productive folding. The amino acid sequences, sizes, and three-dimensional conformations of protein molecules can be manipulated by protein engineering, in which the basic techniques of genetic engineering are used to alter the genes that encode proteins. These manipulations are used to generate proteins with novel activities or properties for specific applications, to discover structure-function relationships, and to generate biologically active minimalist proteins (containing only those sequences necessary for biological activity) that are smaller than their naturally occurring counterparts. Many subtle variations in a particular protein can be generated by making amino acid replacements at specific positions in the polypeptide sequence. For example, at any specific position an amino acid can be replaced by another to generate a mutant protein that may have different characteristics by virtue of the single replaced amino acid. Amino acids can also be deleted from a protein sequence, either individually or in groups. These proteins are referred to as deletion mutants. Deletion mutants may or may not be missing one or more functions or properties of the full, naturally occurring protein. Moreover, part or all of a protein sequence can be joined or fused to that of another protein. The resulting protein is called a hybrid or fusion protein, which generally has characteristics that combine those of each of the joined partners. Any of a class of high-molecular-weight polymer compounds composed of a variety of α-amino acids joined by peptide linkages.